"This is a most disturbing post, since recently on this forum we were informed that "Legal immigrants have nothing against illegals", or words to that effect. It's pretty upsetting, because we've been assured that ALL you guys (legal and illegal) are really 'just the same'. Are you now telling us that this is NOT THE CASE?......hmmmmm This changes everything. Pardon me while I collect my thoughts...."
have never taken a penny from the government or our sponsor and neither have I or my other siblings. In this great country you can make it and there is no excuse for depending on the government or anyone else for any handouts. That to me is a good citizen of this or any country! I am not playing your game, amc760. That quote to which you refer to was written by a Mexican, not me-----and, several other 'Hispanics' of Mexican lineage have confirmed the information as well. Here's a few examples of the racism in Mexican culture. The thing I find most convincing AND convicting is that most Mexicans seem to be PROUD of it. What a bunch of hypocritical BS. What game?? That was what we were talking about! and do you actually believe this is common behavior? C'mon man, it's commemorated in the country's POSTAGE !!! Families splitting up over its darker and lighter members? Sorry, I mustve had that one missing from my collection. Whatever, fella. 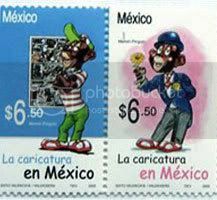 You do realize the stink that would be raised if America issued a postage stamp that was this blatantly racist, don't you? And yet you will ignore that OBVIOUS racism in order to focus on whether or not an individual family segregated itself based upon skintone?